The whole top half of Spider-Man’s costume, including gloves, is a single piece. Peter Parker and Aunt May live in a rented house. They evidently relied on Uncle Ben for their income. Flash Thompson, the blond boy with the T on his shirt appears to have morphed in a dark haired boy with an O on his shirt. None of the other schoolkids are named. A hero’s enemy needs to be the opposite of that hero. It might be that the hero is strong, but not-too-bright, so the villain is weak but brilliant. It might be that the hero is a brilliant scientist so the villain pursues the occult and magic with equal genius. The editor of Harvey Comics told Joe Simon that his character the Silver Spider (who Joe had briefly considered calling Spider-Man) should have a nemesis who was the natural enemy of a Spider. “Either The Fly or Mr D.D.T”. Steve Ditko and Stan Lee came up with something better. They left us, maybe eight months ago with the message that “with great power there must also come, great responsibility”. That is the moral core of Spider-Man; so his enemy must be the opposite of that: someone powerful but irresponsible. In a speech given in March 1929, British Prime Minister Sir Stanley Baldwin (arguably quoting Rudyard Kipling) attacked the growing power of the press. The newspapers attacking me are not newspapers in the ordinary sense. They are engines of propaganda for the constantly changing policies, desires, personal vices, personal likes and dislikes of (the editors). What are their methods? Their methods are direct falsehoods, misrepresentation, half-truths, the alteration of the speaker's meaning by publishing a sentence apart from the context...What the proprietorship of these papers is aiming at is power, and power without responsibility – the prerogative of the harlot throughout the ages. Power without responsibility. Spider-Man's nemesis, his moral opposite was not a supervillain, but a tabloid editor. Did Stan Lee know from the beginning that the relationship between Peter Parker and J Jonah Jameson would define his comic for at least the first decade? I doubt it. Why launch a comic which has at its heart the feud between a superhero who tries to do good and a newsman who represents him as doing evil, but leave the newsman out of the first installment? It would have been a good pitch: better than “a kid who climbs walls” or “a comic which breaks the rules.” But J Jonah Jameson never features in Stan Lee’s myths about how his wonderful idea was rejected by an uncomprehending publisher. When "Mr Jameson" came on stage, for the first time, on the third page of Spidey's first issue, did Lee and Ditko know that he was going to appear in every issue from now on -- one of only five regular supporting characters? It seems unlikely. In Amazing Spider-Man #1, Ditko makes more use than usual of stereotypes and caricatures — characters who appear for single panels and embody particular types. He’s rather good at them. We have the evil capitalist landlord, come to kick the old lady out of her home, with a bald head, bow tie and cigar; the snooty bank teller with fussy suit and little round glasses; the cook who won’t even give Peter a dish-washing job, with bare arms, apron and paper hat; and the man to whom Aunt May pawns her jewelry… Ditko had a thing about bald men and cigars. Jameson could easily have been one more vignette — the nasty journalist in his shirt-sleeves, long fingers ready to start hammering on a big old manual typewriter, and a toothbrush mustache in case we were in any doubt as to whether he was a goody or baddie. He gets fleshed out a bit in the second half; but for all anyone knew, the next chapter might have introduced a different opponent — an F.B.I agent, perhaps? At this point, Spider-Man is little more than a character that Peter Parker plays on television. Jonah Jameson is going to take control of Spider-Man’s celebrity and tell a different story for his own ends. Parker cares a great deal about what other people think of him, and from on now people will think -- to quote another fictional tabloid editor -- what J.J.J. tells them to think. The three chapters which appear in Amazing Spider-Man #1 each has its own title and logo “Spider-Man”, “Spider-Man part 2” and “Spider-Man part 3”. Each chapter could very easily have been presented as a single item in an anthology comic. Part 1, in particular, would have worked nicely as a stand alone: a superhero story without a villain, long before the justly famous Amazing Spider-Man #18. It begins and ends with Peter Parker having a temper tantrum; and covers a lot of ground in between. 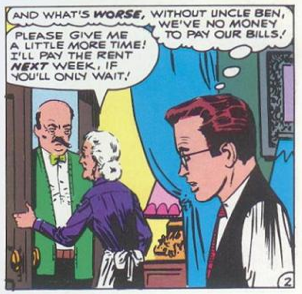 Aunt May is poor; she is going to be kicked out of her home. Peter Parker briefly considers turning to crime; but instead, he resumes his show-business career -- until Jameson terminates it by printing lies in his paper. The final page in particular is wonderfully immersive; we feel Parker’s desperation as Stan Lee gradually closes off all his options. He can’t cash his cheque; he can’t work on TV; he can’t even get a job washing dishes…and then he sees Aunt May pawning her jewelry. This breaks Peter Parker, and the final panel shows him pounding the wall in anger. It must, incidentally, have been a very strong wall. Stan Lee is very proud of the cheque-cashing scene, citing it over and over again as example of Spider-Man’s realism, of the kind of thing that wouldn’t have happened to any other super powered character. The voice of the snooty bank teller is rather fun ("don’t be silly, anyone can wear a costume") but the scene doesn’t actually make a lot of sense. Spider-Man is, at this point, basically a stage persona, so there is no reason not to reveal his true name to his agent; and his agent warns him that a cheque made out to Spider-Man will be uncashable. The scene is really there to get us over a plot difficulty: if Spider-Man is a huge celebrity, why isn’t Peter Parker rich? Jameson is also, at this point, a narrative answer to the question "if Spider-Man could have a lucrative stage career, why does he get involved in dangerous adventures?" Chapter 2 goes off in a different direction. Ironically, J Jonah Jameson's son John is an astronaut; ironically, his rocket-launch goes horribly wrong; and ironically the person who saves his life is Spider-Man. Up to now, we have seen crowds of people looking at and reacting to Spider-Man: this section begins with Peter as part of the crowd watching John Jameson launched into space. 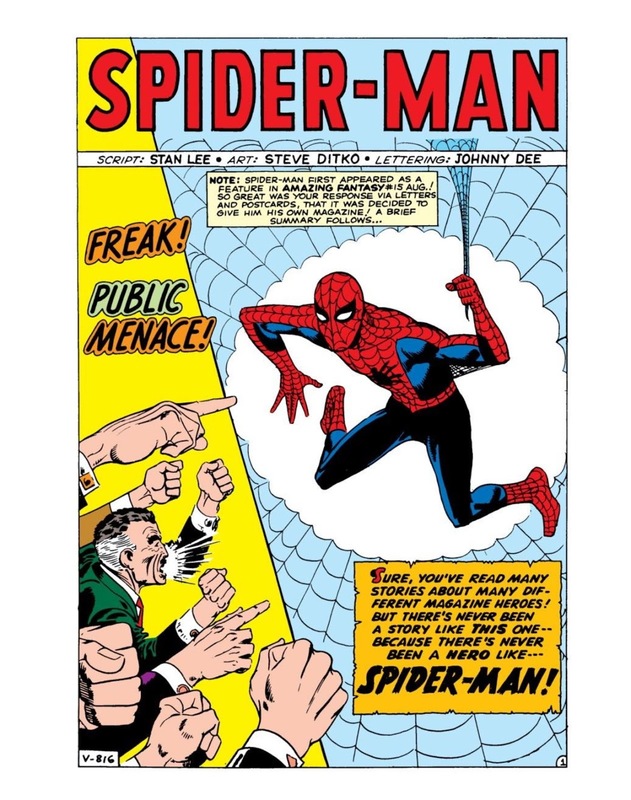 Page 11 and 12 are some of the most dramatic and kinetic scenes in the early years of the comic; Spider-Man leaping from an army jet to the out of control space capsule and changing its direction with his physical strength and web. This is the first time Spider-Man acts altruistically: the guy who told the police officer that catching criminals was not his job leaps into action to save his enemy's son just because he can, and because he is the only person who can. (If he thinks that he has a responsibility to do so, he doesn’t say so, and he certainly doesn’t think that he’s doing it for Uncle Ben.) But it is a very public act, and Peter Parker is still thinking in terms of celebrity. He doesn’t think that he has done a good thing for its own sake, or to partly atone for the bad thing he did a few weeks ago. He thinks that he has restored his reputation; taken his story back from Jameson, and (most importantly) that he can now resume his career as a TV celebrity. Of course, it doesn’t turn out like that. Why does Jameson hate Spider-Man? Lots of reasons will be given over the next few issues: that he's a bad man bringing down a good one; that it sells papers; that he honestly believe vigilantes are a public menace. But today, his motivation is simple enough. Jameson resents Spider-Man getting the publicity that he feels should go to his son John. On page 1 of this comic, Spider-Man is literally shown with a spotlight shining on him. On the final page Jameson says that Spider-Man engineered the disaster and the rescue in order to “steal the spotlight” from his son. Publicity, fame and celebrity are what this comic is all about. The final page is genuinely shocking; turning the agony up a notch. The mob turns against Spider-Man. He has no way of making money, and May has no more jewels. The FBI put out a warrant and issue a reward for his capture, and even Aunt May thinks Spider-Man is evil. And there, tragically, Stan Lee and Steve Ditko’s experimental graphic novel comes to an end. It has clearly been left unfinished: parts 1 and 2 are six and five pages long, respectively where chapter 3 stops after only three. The “the end” box has clearly been stuck onto the art after the fact. So, nothing comes of this dilemma. Peter Parker doesn’t stalk the city by night, whatever that means. The FBI make no attempt to arrest him, and within a month or two, everyone will have forgotten that he's an outlaw. Next month, Spider-Man will solve all his financial problems at a stroke, foil an alien invasion, and the comic will reboot with Spider-Man as a professional crime fighter. There is no point in mourning unmade films and unwritten books. Spider-Man, the Spider-Man we fell in love with, is a crime-fighting superhero with a lack of self-confidence and a tendency to over-worry. But still. I wish there were some way of knowing what Ditko and Lee, in the absence of editors and sales figures and pesky readers, would have put into Amazing Fantasy #17. This is part of an on-going project to write a commentary on the early years of Spider-Man. If you think this is worthwhile, please consider donating 50p or £1 each time a new section comes out. Jameson as power without responsibility: I love this framing, but upon consideration I don't think I can agree. The Baldwin quote notwithstanding, back in the Kennedy administration most Americans had a positive opinion of newspaper publishers. Undeservedly positive, no doubt; but nonetheless, they were considered pillars of the establishment. A free press was a vital and necessary component of The American Way; these were the men who ran it. They might be flawed, they might have their little quirks, but on the whole they were decent and upright. The type specimen -- American's most famous newspaper publisher, in 1963 -- would have been Henry Luce: opinionated, workaholic, "difficult", but a patriot and a philanthropist, a firm supporter of religion and decency, a brilliant businessman who spread American values across the world, an ardent anti-Communist who invented the phrase "American Century". Jameson is clearly working off that midcentury stereotype. He's loud, opinionated, difficult, not easy to work for, a bit of a figure of fun. But he's not, in fact, irresponsible about anything but Spider-Man. The Bugle seems to be a respectable paper that prints real news. Jameson is obviously a respected and competent leader -- when he's not going on about Spider-Man. Later writers would attempt to retcon various explanations for Jameson's obsession. But in the context of 1963, it wasn't really necessary. Newspaper publishers had their crotchets and whims; that was expected. They would get bees in their bonnets and gin up crusades. In the long view of history, sometimes this would have immensely positive effects (Luce came down hard in favor of civil rights) and sometimes it would be tragic (he'd been a huge booster for Joe McCarthy). And sometimes it would just be random: a newspaper might become violently hostile to the Mayor because circulation needed a boost. But it was anyway accepted that sometimes newspapers would go a little nuts for no good or obvious reason. I think it might be more useful to compare Jameson to another Marvel figure of the same era: General "Thunderbolt" Ross. They're both Establishment figures, prominent in respected institutions. When not interacting with their superhero targets, they both seem to be competent at their jobs. They're both choleric, blustering personalities. They're both obsessed with the superhero targets. Hell, they even both have mustaches. And -- here's an odd detail -- both have pretty young women named "Betty" in their orbit, who become romantically involved with the hero. I do think that some of the "countercultural"vibe of early Marvel comes from the presence of these characters. They're mature, successful white men, at or near the top of the power structure, surrounded by and embedded in the visual symbols of success -- Ross's tanks and planes and chest of ribbons, Jameson's skyscraper office, secretary, vest and cigars -- but they're ultimately in the wrong. They're persecuting the innocent. What makes this particularly problematic and interesting is that _they are absolutely allowed to do this, and to continue doing it_. At least during the Lee-Kirby era, nobody ever criticizes Ross for destroying millions of dollars of hardware in endless attempts to kill the Hulk. We never see other newspaper publishers criticizing Jameson's obsession with Spider-Man; even his own staff just take it for granted. And it doesn't seem to be damaging the Bugle's circulation numbers. These men may be obsessives, but they're being allowed to act out their damaging obsessions. Nobody will stop them. The system is not just.